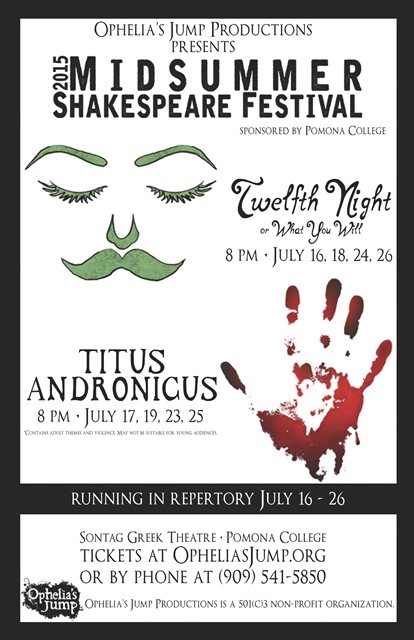 Ophelia’s Jump Productions will open its annual Midsummer Shakespeare Festival on July 16 with Twelfth Night, followed by Titus Andronicus the following night. 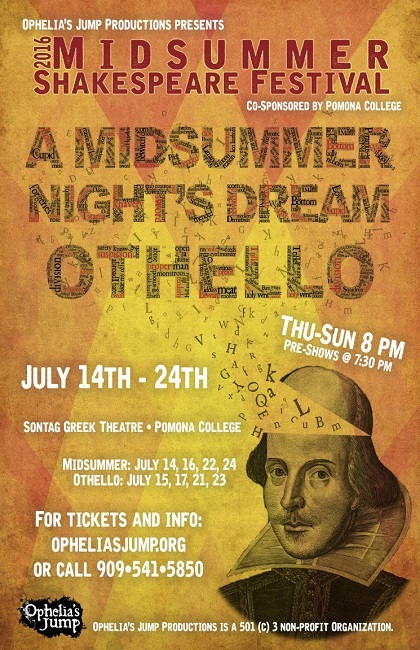 Performances of both shows will continue running in rep through July 26 at Pomona College’s Sontag Greek Theatre, an outdoor amphitheater originally built in 1910 and renovated in 1997. The productions are directed respectively by co-founder Caitlin Lopez with Jenny Powell and founding artistic director, Beatrice Casagran. Twelfth Night begins with shipwrecked twins, Viola and Sebastian. Believing her brother drowned and determined to survive alone, Viola disguises herself as a boy, Cesario, and enters the service of Orsino. Orsino sends Cesario to woo Olivia on his behalf. But Olivia becomes more interested in Cesario than Orsino and the play becomes a a merry-go-round of mistaken identities, high comedy, low tricks and desperate passion. In Titus Andronicus, a veteran general and war hero returns to the city after a period of bloody conflicts with the Goths. Titus plans to bury several of his sons who have been killed in the conflict and spend his retirement with his remaining family including his only daughter, Lavinia. However, his unwillingness to depart from the dictates of the law and show compassion for a vanquished enemy, incites the ire of the defeated Queen of the Goths and initiates a vortex of revenge that ultimately swallows them all. On Saturdays and Sundays, arrive early and enjoy local musicians, artists, and crafts before the show beginning at 5:30 pm. Each performance opens with a 30-minute Green Show. Bring a picnic and blanket or cushion for added comfort. Tickets and more information: www.opheliasjump.org. Mosaic Lizard Theater will incorporate a variety of movement disciplines into its upcoming production of The Tempest, directed by MLT Associate Director, Greg Langner. 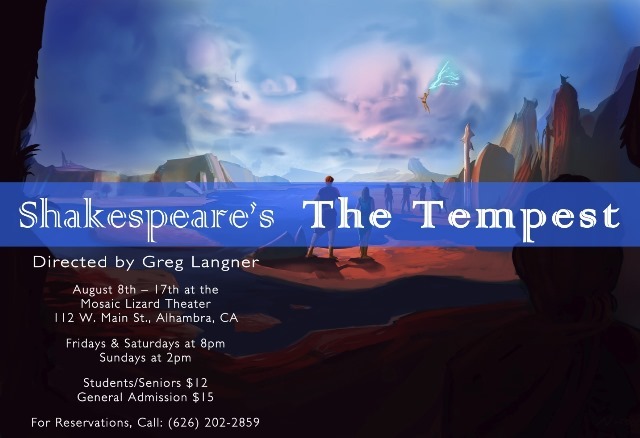 The Tempest will run August 8 – 17, and features a cast that includes Zack Guzman as Prospero, Lauren Estrada as Miranda, Lisa Lozano as Ariel, Josh Puga as Caliban, and Dominic Durran as Ferdinand, with Jessica Bernal (Alsonso), Mignon DeLarre (Antonio), Rachellynn Walker (Stephano), Bianca Gregory (Trinculo), Toby Guebert (Gonzalo), Jonathan Hull (Sebastian), and Summer Stratton (Boatswain). 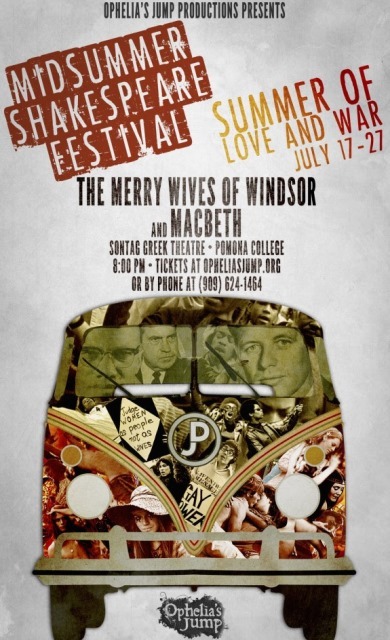 Shakespeare’s hilarious, tongue-in-cheek comedy, Merry Wives of Windsor, and his cutthroat tale of corruptive power, Macbeth, will be presented in repertory at Pomona College’s beautiful Sontag Greek Theater in Claremont. 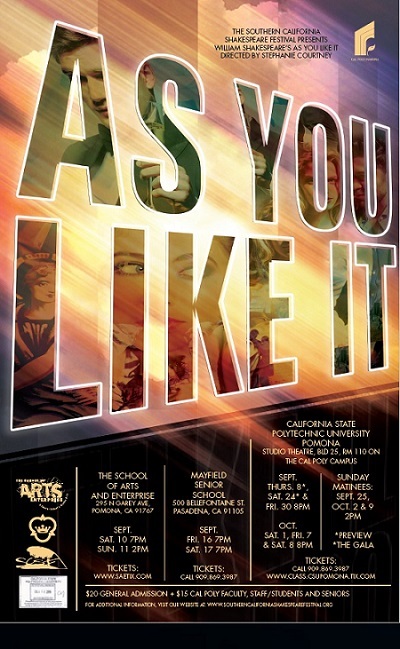 Produced in cooperation with The Pomona College Department of Theatre and Dance, performances begin July 17 and will run through the 27, with founding artistic director, Beatrice Casagran directing Merry Wives and associate artistic director Kevin Slay directing Macbeth. Set in the late 1960s, Shakespeare’s works will be given a fresh, colorful perspective in the amphitheater which was originally built in 1910 and renovated in 1997. Inland Valley Repertory Theater Company (IVRT) has announced its 2014 season, which will include a special production of Shakespeare’s A Midsummer Night’s Dream*. The company performs on Tuesdays and Wednesdays on the stage of the Candlelight Pavilion in Claremont. IVRT received a $17,000 grant from the Los Angeles County Arts Commission to continue its mission of presenting high quality local theatrical productions to promote the talents of aspiring actors of all ages. The grant is awarded based on an assessment of artistic achievement, administrative strength, and fiscal stability. “This grant presents an exciting opportunity for IVRT to continue to attract top talent and produce great theater,” adds Minano. 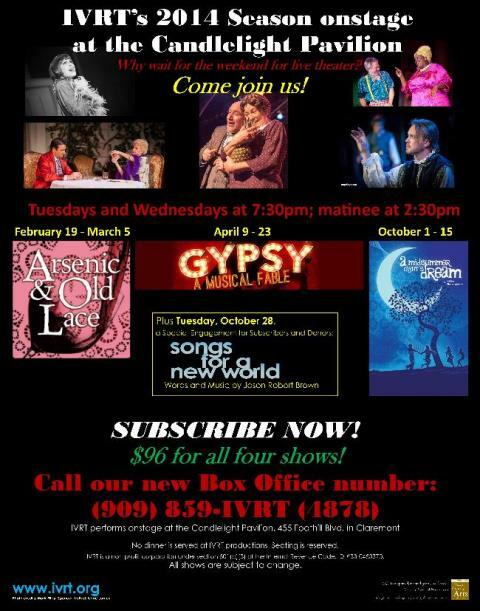 The 2014 season schedule also includes Arsenic and Old Lace (Feb/March), Gypsy (April) and Songs for a New World (August). “Talk Back Tuesdays” will feature discussions with the director and cast members prior to the Tuesday performances. For tickets, full schedule and more information, visit www.ivrt.org. *Actors wishing to audition for A Midsummer Night’s Dream, directed by Terre Gunkel, will find audition information on IVRT’s website at www.ivrt.org/auditions.php.